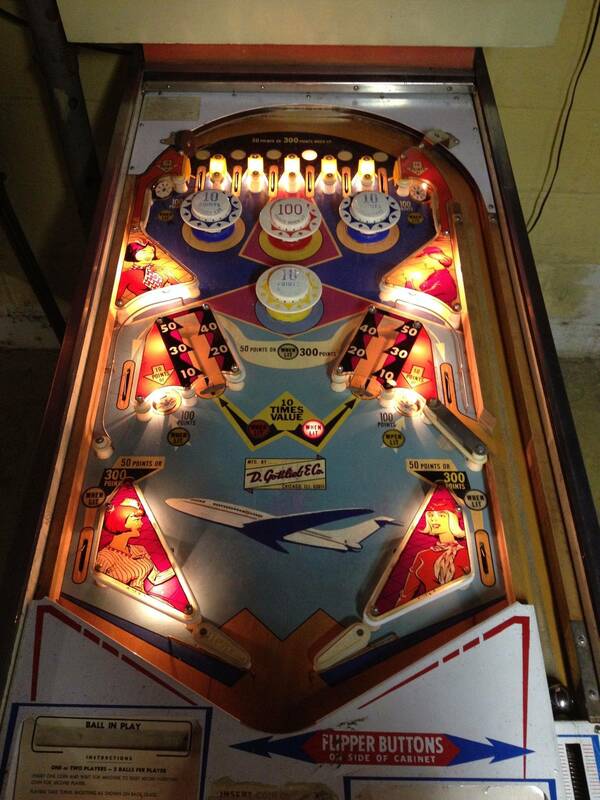 » Forum » Electro-Mechanical » EM Pinball Hangout » gottlieb 60's multi players. » gottlieb 60's multi players. am i the only collector that prefers the multi player gottlieb 1960's games? have a row of them including happy clown, pleasure isle, swing along, oklahoma, fashion show and some others, all work and are really tidy. not one 1960's single player from any era. another 2 walls of 1970's single player gottlieb and some williams single player games. anybody love the multi players from the gottlieb 60s more than the single players? I cant say that I prefer them but I do like them. I own 3. Lancers,Paradise and Sea Shore. I bought the lancers as a brunette match to my majorettes but I sold my majorettes;(. I really love my Sea Shore. I think I prefer to play that over most of my single 60s's gottliebs. not to change the direction of your thread but ... 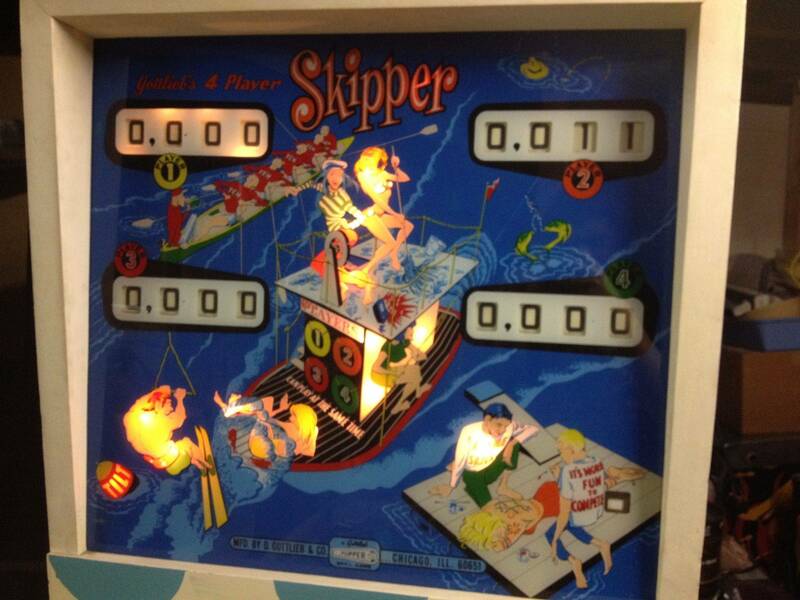 I prefer two player gottlieb 70s machines .. the most. more artwork than 4 player and a bit more rare. I guess perhaps they just aren't as "collectible" without the tag wedgehead. My only preference, is, is it a pinball machine? then its all good. It is hard to play competition on a one player, but we still do it. Only have the one 60's 2 player. Always looking for another EM pin. I think Williams had more good multiplayers in the 60s, but we love our Surf Side and Fashion Show too. I don't like them. They have barely existent rulesets and just about hitting standups for points. Kind of like Whoa Nellie. Which I do like. So whatever. but no, not a fan of gtb 60s multiplayers. They didn't figure it out till the 70s. I disagree because a few 60's Gottlieb multiplayers are super fun and unique. I own a Pleasure Isle it'll be one of the last pins they roll out of my house when I push up daisies , my other 60's multiplayer is Mayfair. it's a nice 2P with twin shooters. 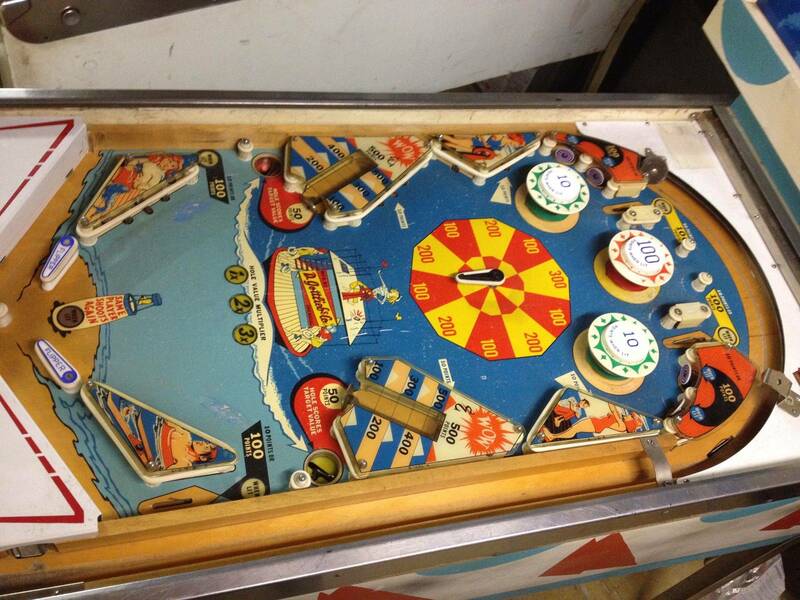 From a nostalgia point : it's the very last of Roy Parker Art and part of pinball History. 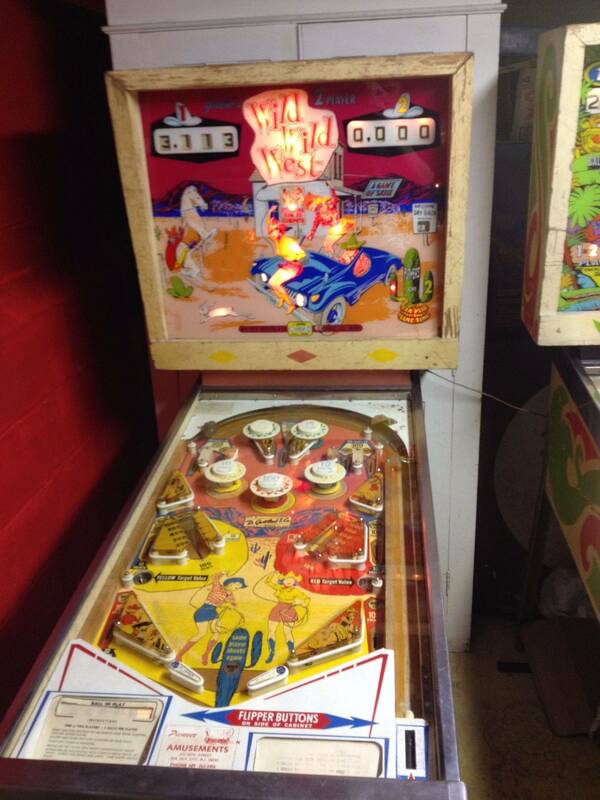 Playfield has MJP which is another plus . Not all 70's 2P are my cup of tea. Duotron and Lawman both lasted under 6 months and I cut bait. A 60's Gottlieb 2P I'd like to own is Surf Side. Bally had some great 2P in this era. The only one I've played was Loop the Loop the replay version . It was a blast . that i will are with! Never had a 60's Multiplayer as there are too many 70's ones I like and with room for only 5 games it will never happen for me anyway. If I did have more space pretty sure I would have to go with the 1965 Gottlieb Dodge City, just a cool layout and gadgets IMO. I was noticing last night, I was playing my Williams el toro and I had it two player and I tilted one player. that ended that first players game entirely. I thought, that was rather a quirky feature.... and then noticing on the bg ... there is a tilt for each player. I wonder , do any other 60s multiplayers .. do the tilt ends a game? im thinking it is ... something Williams done but after thinking about it, with no accumulated bonus .... to lose, all one would lose otherwise is that .. one ball being drained. I think you are mostly talking about the rat-trap-score-reel-era games but the later 60's games are great too. Here are the ones I am lucky to own with pictures throughout my collection history. 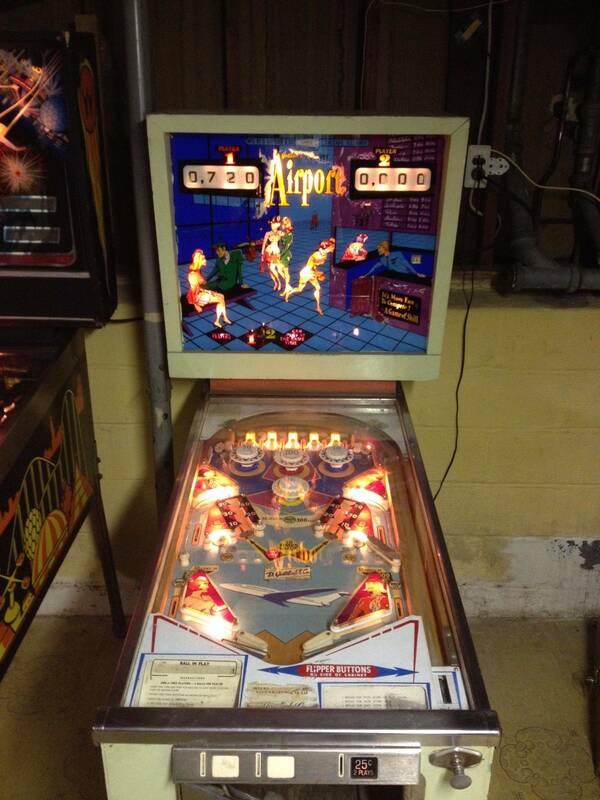 Airport is taken apart now and is in the restore queue, you never see that title and I was lucky enough to find a much nicer used backglass on local Craigslist from a random non-pinball guy (he's had it stored away in the dark since 1984), can you believe that... Will be put in the machine once I finish the cabinet up. Most Gottlieb single-players have a game-ending tilt up until the late 70's I believe if not even there. My Bally Star-Jet has game-ending tilt per player, two tilt lights. Pretty much the reason Gottlieb probably didn't do like their single-players is because all the extra hardware and work it would require - hence the reason for the only "ball-ending" tilt I would assume. Not entirely true. Most AAB single player pins have penalty of ball in play plus 1 ball. There is a pin adjustment but I played these pins on route and that was the norm. I prefer single players with the smaller backglasses. Although, SkyRocket fits in nicely with the wedgeheads. Only multi player Gottlieb I own is Dodge City and it is a game I've loved since the early 70's. Might have to diverse and add games such as Quick Draw and Jumping Jack but those would have the large backglasses. Only mentioning those two since they're great games and Wade has them in his queue. Most AAB single player pins have penalty of ball in play plus 1 ball. the remainder of the game (slam switch and tilt ball).. The problem with multiplayer games never really changed until the SS era. You basically played five 1 ball games. There was no progressiveness to a game like there was with single players. You always went back to the start, excepting your score. This was especially true on drop target games. I don't dislike them, but they'll never replace a single player for me. I only own two, Grand Prix and Time Zone. No Gottliebs at all. Some games carry over vari-target, ball locks, and bonuses between players (making it so you can "steal them") and sometimes even between games. So, it's a little variety. I like the whole "stealing" thing which stopped with EMs, it provides a unique challenge - to either score your own award, steal your opponent's award, or hope yours doesn't get taken. The mid/early 60's Gottlieb games have bonuses that don't reset with the game, and some of the vari-target games carry over between players and new games. My Airport (first game with them) always resets them I believe, but on Wild Wild West and Skipper they do not. Skipper has a jones plug adjustment to make them reset between players (and very presumably between games), I did not notice this adjustment option on Wild Wild West though. The problem with multiplayer games never really changed until the SS era. You basically played five 1 ball games. There was no progressiveness to a game like there was with single players. You always went back to the start, excepting your score. There are a few multiplayer games that don't reset between balls. The 2 player '68 Paul Bunyan is one. My wife and I like to compete on it but it's annoying when I get the ABC targets lit in order then drain the ball and my wife "steals" all the high scores from it then drains the ball leaving me to do the hard work of getting ABC lit again or the other way around. I prefer single player games but I'm keeping this one because my wife and I play for a dollar on it and it's a fun game. photo taken last night. not all 60s gottlieb multi players. capersville will move to another wall and be replaced with a new 60s gottlieb next sunday. I do have one Single-Pplayer pin running "Ice Revue***". 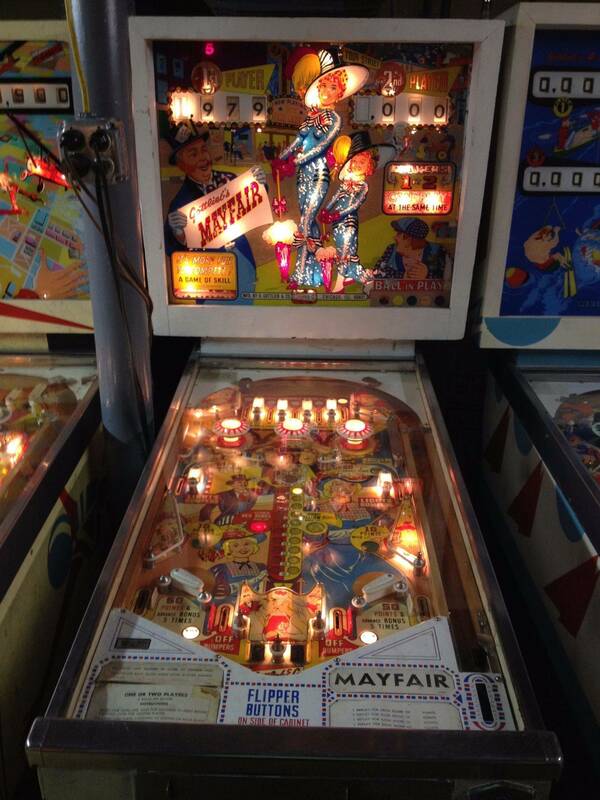 I started playing pinball in the very late 1960ies - at that time almost every pin imported into Switzerland were 4-player-pins - (maybe) some old beaten-up pins in the back of the arcade-rooms may have been one-player-pins. So I actually cannot talk about one-player-pins. 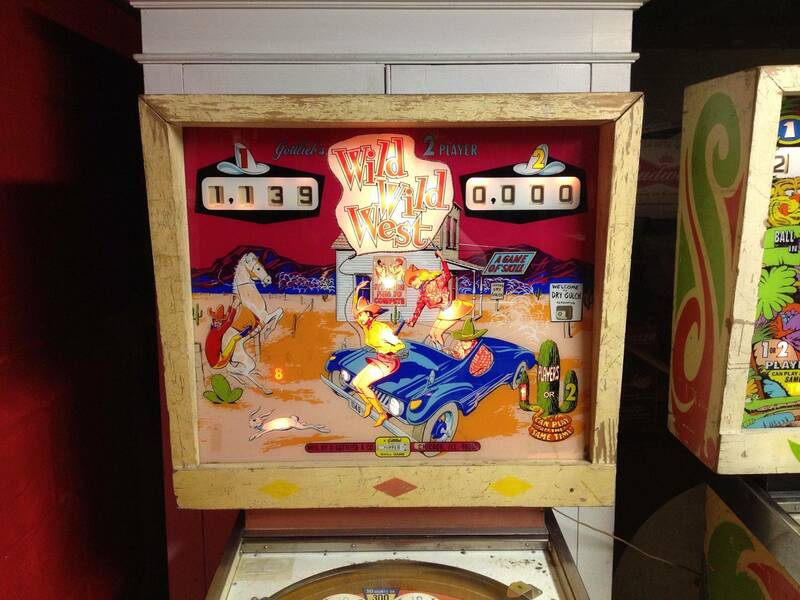 A friend of mine owns a Dancing Lady - with a carry-over: http://www.ipdb.org/showpic.pl?id=635&picno=8721&zoom=1 we can light the bumpers by hitting switches (rather, near) top of playfield . The lanes on the sides turn the bumpers off --- I can profit when the other player does light-up the bumpers and the ball drains --- I HAVE the bumpers already lighted. When I do the advanced search http://www.ipdb.org/search.pl?mfgid=93&yr=1960-69&pl=4&sortby=date&searchtype=advanced --- I know Liberty Belle, Ship-Mates, Dodge City (! ), Dancing Lady. Dodge city is an awesome game ! definitely on my buy list !!!! so yes there are guys out here that prefer 4 players, or 2P games better than single players..
100% Not True. Pleasure Isle is progressive and keeps the ABCD reward active it does not reset on drain. As player 1 when you knock out ABC the second player only has to achieve the D to get the reward. If he does not get the D, then player 1 has that opportunity on his or her next ball. Additionally any player can earn up to 5 extra balls and not lose their turn until all the extra balls are exhausted. These balls are cleverly displayed as rotated illuminated beach balls in the backbox as part of a double animation. Pleasure Isle is progressive and keeps the ABCD reward active it does not reset on drain. As player 1 when you knock out ABC the second player only has to achieve the D to get the reward. If he does not get the D, then player 1 has that opportunity on his or her next ball. 1966 Hi Dolly, is the same. Carry over ABCD.